Speech Therapy Plus LLC. Pediatrics Speech Therapist. Pediatrics Speech Therapist, can teach your child to communicate with others. An impairment making it difficult to form clear, complete sentences when speaking. Since it is hard to find the correct words. It can also be difficult to understand others. You might notice your child has a very basic vocabulary. Speaking in short, incomplete sentences. Answering simple questions can be difficult. Children normally show signs of Expressive and Receptive Language Disorders by age 4. Expressive: Difficulty expressing ideas and thoughts. Mixed Receptive and Expressive: Having difficulty understanding and speaking. Pediatrics Speech Therapist can help solve these. ASD is a group of developmental disorders. It includes a large range of symptoms and levels of disability. Includes trouble with social interaction, communicating with others. Along with different behavioral challenges. Social Problems: Difficulty communicating or interacting with others. Repetitiveness: Repeating behaviors and limited interest. Symptoms can be noticed by the age of two. They can be mildly noticeable or severely disabling. Diagnosis is done by studying the child’s development and behavior. The results will help in a treatment plan. Many individuals can live independent lives, be productive in the workforce and develop meaningful relationships. Problems making sounds, substituting sounds, leaving off sounds, adding sounds or changing sounds can be Articulation/Phonological Disorders. This can make it difficult for others to understand the individual. Children often make speech errors, and may have this disorders if the errors continue. Keep in mind that not all speech errors are a disorder, but perhaps just a dialect or accent. Evaluation can be done by a speech-language pathologist by listening to the person and using formal articulation tests. They may also determine if the muscles in the mouth are correctly working. This is a motor speech disorder (CAS). Children with CAS can have problems with sounds, syllables and words. There is a problem with the brain sending signals to the lips, jaw tongue, etc to create speech. Even though there are a number of possible causes such as a brain condition or injury, stroke or infection, many times the exact cause is not determined. Some early signs of childhood apraxia can include limited babbling, inconsistent or increased errors with longer/complex syllables. Omissions, distortions, excessive stress and loss of previously pronounced words. Other signs may include eating issues and clumsiness. A speech therapist can be helpful in identifying CAS. Refers to how the central nervous system uses auditory information. Children may show a range of listening issues. It might be difficult to understand someone in a noisy environment, not able to follow directions, or tell the difference between similar speech sounds. Diagnosis can be done by an audiologist. A series of hearing test will be administered and once diagnosed, the disorder can be determined. Treatment will focus on three main areas such as: changing the environment, develop skills to handle the disorder and remedy the auditory deficit. Is our social language skills, and includes what and how we say something along with our body language. Pragmatic skills are important for communication. Children with poor pragmatic skills often misinterpret communication and therefore have a difficult time responding. Adults can help children use language correctly in various social situations. Social/Pragmatic Language can be difficult to detect. An interruption in the flow of speech. Not being able to speak continuously and smoothly. For example stuttering and cluttering. Stuttering is an example of a fluency disorder which can be caused by physical tension or a negative reaction. The severity of stuttering is often more severe based upon the situation and an increased pressure to communicate, it can differ from day to day. Cluttering is another disorder that is rapid or an irregular rate of speech. Speakers have a breakdown in clarity of speech because the cluttering is at a rate to fast for the speaker to handle. Speaker may not be aware of the actual cluttering but can be aware that others find it difficult to understand them. There are a variety of treatments based upon the finding of a primary physician and a speech-language pathologist. The common name for Orofacial Myofunctional Disorders. The tongue moves to far forward during speech and/or swallowing. Children often have a swallowing pattern where their tongue moves to far forward, but by six months lose this reflex. Signs that this has not gone away will include a child looking, speaking and swallowing abnormally. Tongue Thrust is often diagnosed by a team of professionals which can include a dentist, orthodontist, physician and speech-language pathologist. 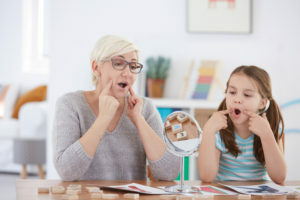 If there are medical issues, those will be treated first and then a speech-language pathologist can develop a treatment plan to change the child’s oral posture and articulation. Voice Disorders affect speech production and are from a medical condition involving abnormal pitch, quality of sound or loudness that are produced by the larynx. A child can develop a voice problem for a variety of reasons. Voice Disorders can cause a drop in the child’s scholastics due to the fact that they feel uncomfortable or are unable to participate in classroom discussions. A diagnosis can be done by a pediatric otolaryngologist and voice-trained speech-language pathologist. A number of treatments are available depending on the diagnosis. 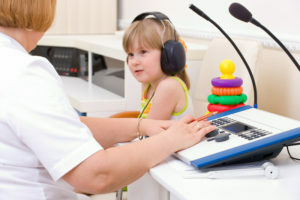 Treatments can include surgery if there is a medical problem with the vocal cords and/or various techniques from a speech therapist. Children with Cognitive Deficits and Disorders will show significant limitations in learning and functioning. In order to correctly diagnosis a child they should have a comprehensive psychoeducational testing done. This should be done as soon as a developmental delay is noticed. Early evaluation and intervention services can assist children in building skills while they are developing. The demands of puberty make it difficult to cope with social interactions for a child with Cognitive Deficits and Disorders. Cognitive Deficits and Disorders are managed by multidisciplinary approach to identify conditions, academic performance, social behavior and independence. 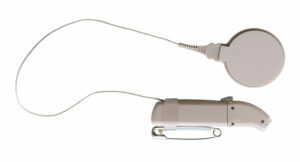 Children with very little hearing have an option of cochlear implants. A speech therapist can help with rehabilitation with Aural (Re) Habilitation by providing the tools for learning to listen. Total communication speech therapy includes developing or expanding the child’s language, listening skills and speech development utilizing the use of picture symbols, visual cues, sign language, natural gestures and speech reading. This can be done through various lesson plans and goals. The speech therapist can also help the parent by showing them milestones to chart their child’s progress to a successful (re)habilitation. Prompts for Restructuring Oral Muscular Phonetic Targets (PROMPT). Utilizing touch to the child’s jaw, tongue and lips to guide them on pronunciation. This technique will help develop motor control for proper oral muscular movements. A speech therapist will “teach” the patients muscles to produce a phoneme (the smallest increment of sound) correctly through the stimulation of touch. Improves the development of oral-motor, visual, and auditory feedback that will help a person to learn to read, write and spell. Unlike a traditional phonics programs it is a basic, more extensive program. The steps in LiPS® include providing a environment for learning, consonant and vowel identification and classification, identifying simple and complex syllables and words, basic spelling and reading, identifying sight words, multisyllabic words, and reading and writing. To teach sound-letter association LiPS uses guided discovery techniques. Students explore physical movements to produce sound and learn to hear, see and feel the physical characteristics of sounds. LiPS® will help a student to become a fluent reader and competent speller. View Julia Chernova on Linkedin.